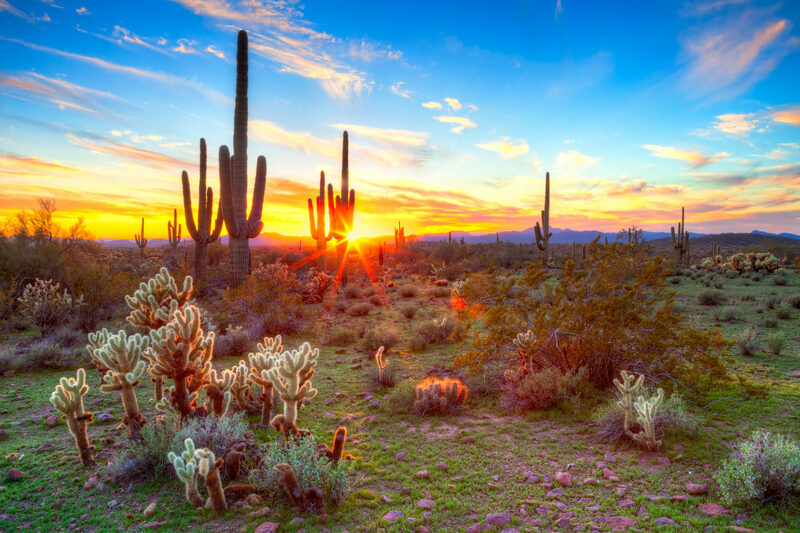 Embark on these five day trips from Phoenix, and you’ll enjoy the chance to explore Arizona’s rich culture, dramatic canyons and colorful rock formations. As the fifth largest city in the United States, Phoenix is home to everything necessary to make a vacation memorable: nearly year-round sunshine, excellent restaurants and nightlife, luxurious spas, top-notch golf courses and an incredible botanical garden. It’s also just a road trip away from some of Arizona’s most incredible experiences. 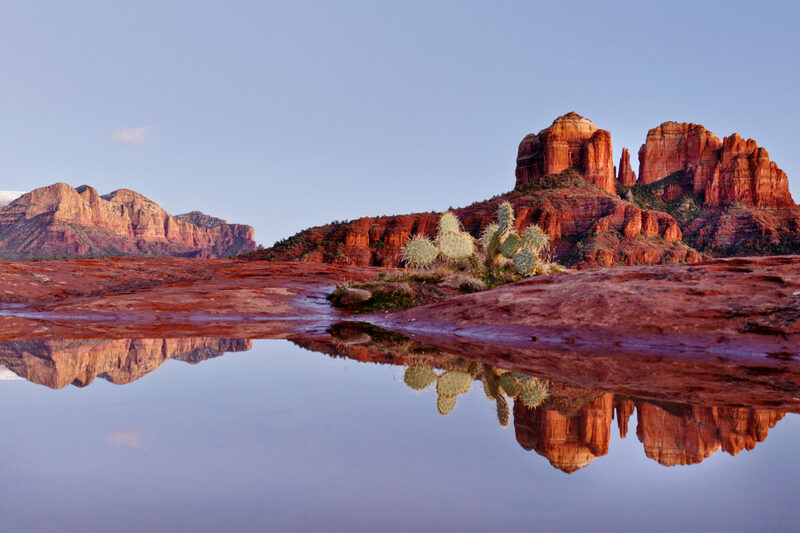 Sedona is a vibrant community situated about two hours north of Phoenix. Filled with free spirits and surrounded by red rock formations and verdant green desert plants, it is ridiculously photogenic and a hoot to explore. It’s what I imagine Mars might look like in the distant future, once it’s been terraformed to accommodate humans. I explored the town’s art galleries, shops and wine-tasting rooms (yes, Arizona has vineyards!). But the must-visit sites are the vortexes. 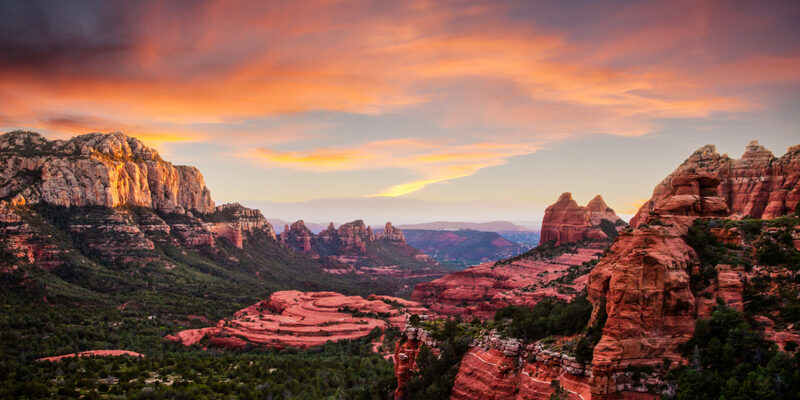 Before I visited Sedona, I didn’t know much about these mystical sites — rare places where (allegedly) the Earth emits a special energy that can have positive effects on visitors. (Perhaps unsurprisingly, Sedona is also a great place to buy crystals, if you’re into that sort of thing.) I tend to be a skeptic, but I couldn’t pass up a chance to harness some Earth energy to better myself, so I hiked to the Cathedral Rock Vortex. I can’t say for sure that I experienced a special energy, but after trudging up to the rock formation and climbing as far as I could go, I did feel an overwhelming sense of peace and calm. And the view was nothing short of breathtaking: sheer, blood-orange buttes set against an azure sky. 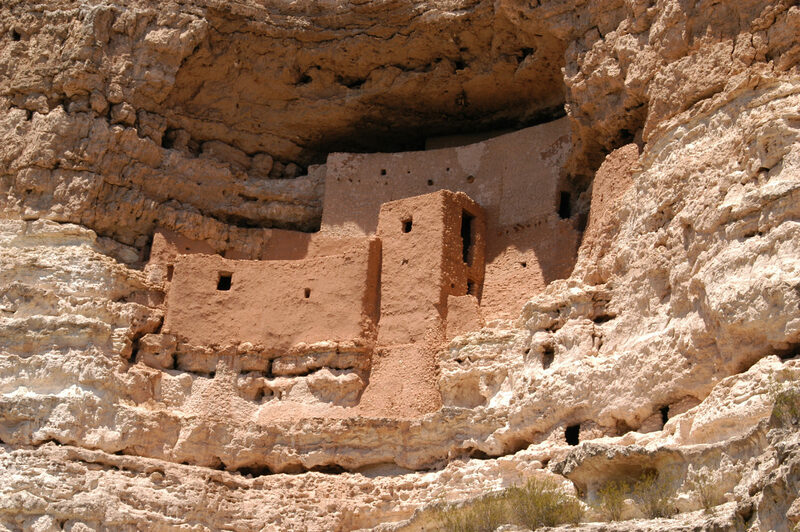 If you’ve ever wondered what a 600-year-old apartment building looks like, visit the Montezuma Castle National Monument. Located about a 90-minute drive north of Phoenix in the Coconino National Forest, the monument — built by the Sinagua people who lived there between 1100 CE and 1425 CE — is a series of structures built into the side of a cliff. It’s accessible via an easy hike through a wooded area. Then climb a few ladders to check out the town itself, which is delightfully intact. 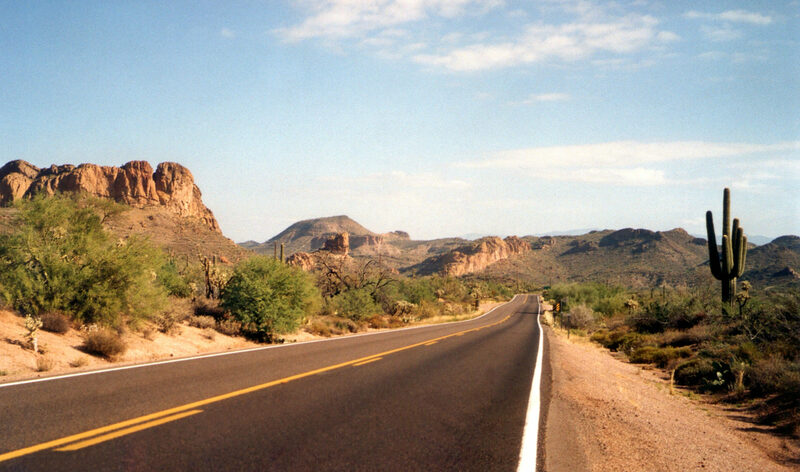 The Apache Trail is an old stage coach route running 40 miles through the Superstition Mountains. It’s also the best place to go if you want to tap into your inner cowboy and discover remnants of the Old West. My first stop on the trail was Goldfield. The reconstructed 1890s Old West ghost town, complete with a saloon, looks like it could be a movie set. Next, I enjoyed a sarsaparilla and some chili in the community of Tortilla Flat (population: 6). It’s the only surviving stage coach stop and consists of a few wooden buildings that look like they are one strong wind away from collapse. Later, I visited the Boyce Thompson Arboretum, where a vast array of desert flora is on display. You’ll find another cliff dwelling here, too — Tonto National Monument — as well as plenty of scenic stops in Lost Dutchman State Park, including Weavers Needle Lookout, a dramatic view of a huge lone butte. The entire trail is a highlight reel of Arizona. 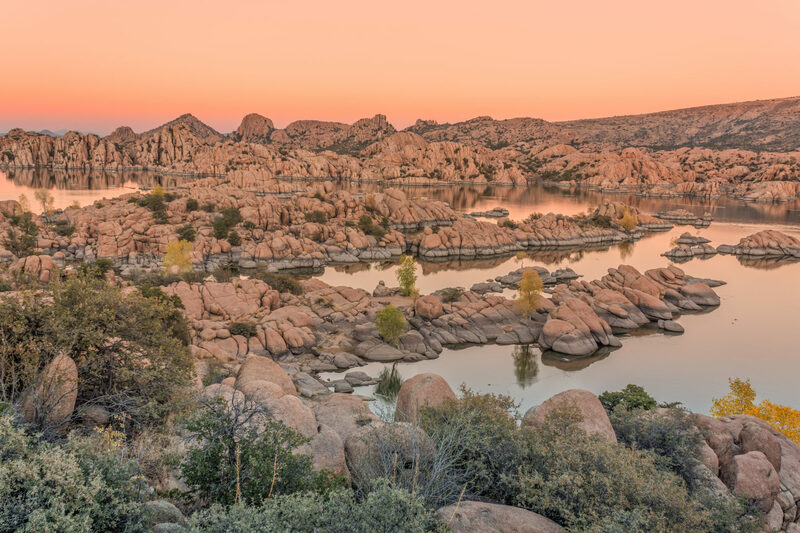 Prescott is a funky little town about a 90-minute drive north of Phoenix. I arrived in the morning and took a walk around Courthouse Square in the center of town, checking out some shops before finding Nick’s Feed Your Face, a fun little sub shop. I grabbed a Torpedo, stuffed with salami and cheese, and drove out to the crown jewel of Prescott: Watson Lake. Located right outside of town, the lake is surrounded by boulder formations and appears to be the perfect place to kayak. So I did just that, exploring the lake’s many nooks and crannies before pulling up to shore to enjoy my sandwich on some boulders, dangling my feet in the crystal-clear water. That afternoon it was back to Prescott for a drink on Whiskey Row. The street is famous for its inordinately high concentration of saloons, which sprung up after the town’s population swelled during the Gold Rush. Today there’s also a sprinkling of cool stores and candy shops. While I was able to indulge my inner cowboy on the Apache Trail, I was missing one key experience: riding a horse past a bunch of cacti. So I drove out to the Sonoran Desert, with its endless fields of saguaro cactus, and signed up for a horseback riding tour. I was soon sitting atop my new best friend, Peaches, as we trotted past endless rows of saguaros and yuccas. I imagined what it must have been like to be Wyatt Earp, out on the open range — although I doubt Wyatt Earp ever rode a horse named Peaches. After traversing a trail, I bid Peaches farewell and headed up a secluded path to the top of a hill to watch the sunset. An amber glow bathed the valley below and the arms of the countless saguaros turned to silhouettes against a fiery sky, as if waving goodbye. I wanted to set up camp and cook a tin of beans, but I’d also heard that the native scorpions tend to come out at night. So I trekked back to the comfort and safety of the big city — content with my brief, yet satisfying, brush with cowboy life.